The user-generated revolution is in full swing worldwide. 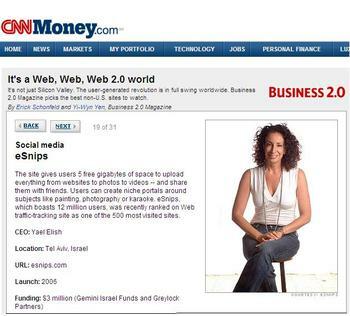 Erick Schonfeld and Yi-Wyn Yen from Business 2.0 Magazine list eSnips as one of the best non-U.S. sites to watch. 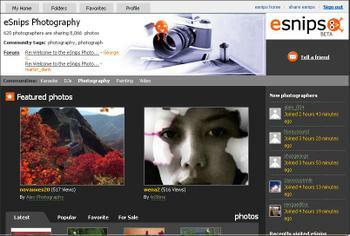 Hallo eSnippers: eSnips has been growing fast and needs a bigger and faster home. We are moving to a new and better data center and are upgrading the equipment and the bandwidth. Bottom line: You'll get a faster and more reliable service. It’s a pretty complex transition that has been in the planning and work for several months now. The transition of the entire service, with the many terabytes of content hosted, has started today and should end in 8 days. There should not be significant disruptions but you may occasionally experience a slower response during this week. We will also have to take the service down for between 3 to 5 hours on the last day of the transition. We will provide an advance notice 24 – 48 hours head of the down time and will make every effort to keep it to the minimum. soWe officiailly annouced the eSnips Micro-Portals at CES, Las Vegas at the Showstoppers event on Jan 8. The Micro-Portals have been receiving very enthusiastic feedback from eSnippers from the very first day they they were added, I didn’t expect the press however to respond as positively to this very new concept. I am amazed at how the Micro-portals are resonating with the media and pretty much everybody I talk to about the Micro-portals. Here are some of the first pieces about the Micro-Portals. Many more should come out in the next 48 hours. Vivek Puri from Startupsquad wrote a great review. Pete Cashmore from Mashable (who I must finally meet sometime) also wrote positively . Gary Price from resourceshelf, who I've known and admired for covered it very nicely too. Here's me doing a radio interview for Dave Graveline's "Into Tomorrow" radio show. "Into Tomorrow" broadcasts on both Satellite services, XM and Sirius along with 110 radio stations around the country, the 5 Armed Forces Networks, Streaming, Podcasts and several other sources. We’d like to wish you a GREAT HOLIDAY SEASON! 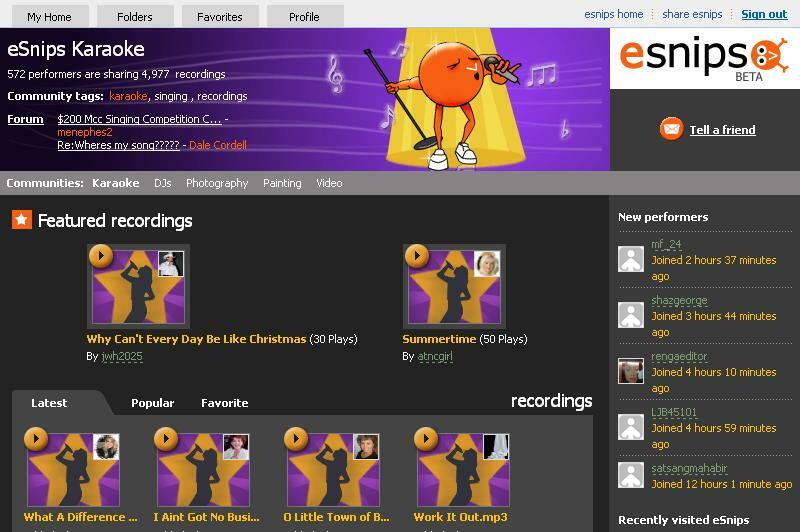 the eSnips home page is all decorated, featuring holiday songs freshly sung and uploaded by members of the eSnips Karaoke community. Ain’t we lucky to have them on board? Enjoy! No doubt I will not receive the bloggers’ award for November. I didn't update the blog very frequently recnetly. The good news is that it's usually a sign that a lot of great new things are in the works and about to be launched. 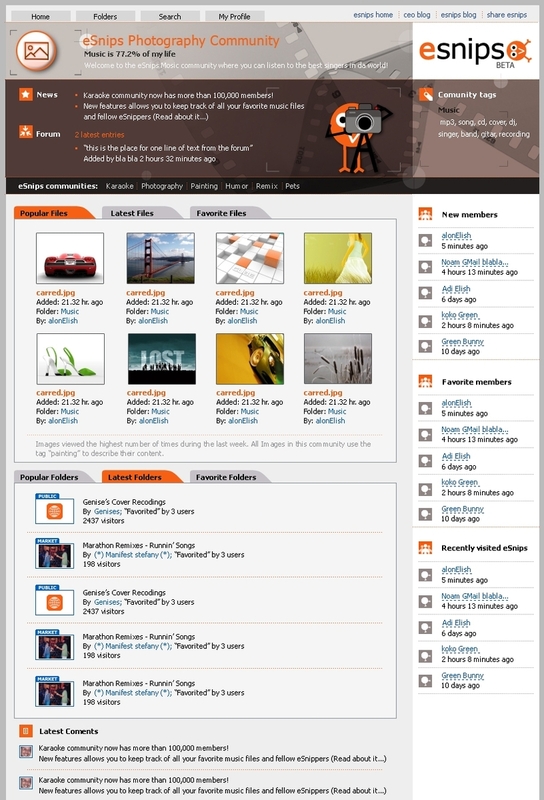 So yes, a new version was launched yesterday with many new features, a handful of new communities and many bug fixes. From the amount of traffic on the site, and from the many comments you sent us, we can tell you like the changes and we love that. More on the new version in later posts. You may have noticed a graphic redesign of several areas as well as the community sites. The person responsible for that is Shahar who very recently joined us to head the creative and graphic design of the site. Picture of Shahar coming soon he promises along with caricatures of all of the eSnips team… if time allows. We’re delighted to announce the launch of the eSnips Micro-Portals. Close to a million people now share content on eSnips. eSnippers share content about almost any topic you can think of from photography to UFOs. Now with the launch of the Micro Portals every such community can have it’s own social portal, or home on eSnips. So what are Micro-Portals? Micro-Portals provide people who share the same interest with a centralized and dynamic view into all the activity taking place in eSnips around their specific area of interest. Ultimately we want every community on eSnips, even the most esoteric one to have a ‘home’. How is a Micro Portal formed? A Micro Portal can be formed around any group of people who use the same tags to describe the content they publish; for example a DJs Micro Portal was formed around people who tag their content with djs, remix and mix. 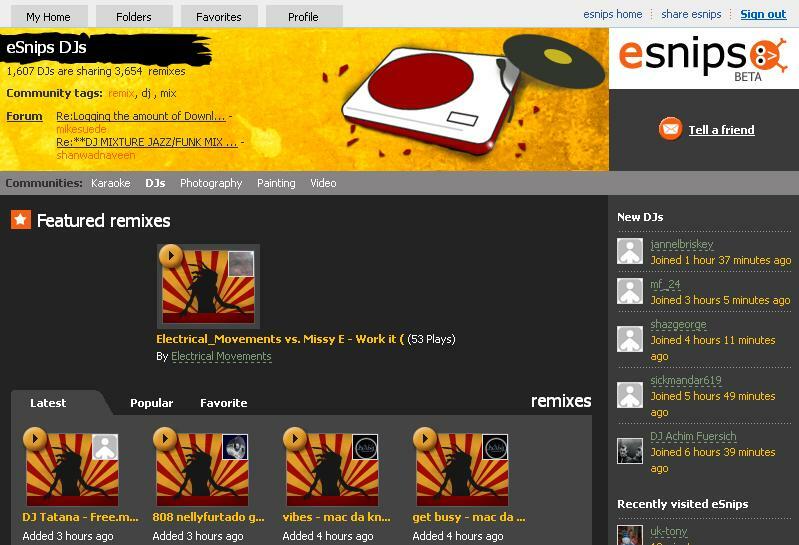 The Micro Portal gets a memorable URL (it’s now http://www.esnips.com/community/remix, and will soon change to http://remix.esnips.com)/ Everything that is going on in eSnips around these tags is surfaced to the Micro Portal: the most recently added mixes, most popular mixes, most ‘favoritted’ mixes, people and/ or folders, recently joined members and so on. We will soon add a forum to discuss community affairs. We’ve started with four micro portals and will soon launch many more. This is still very much in it’s initial mode and your comments are very important at this very early stage. Here are the links to the first four Micro Poratls (as I wrote in the DJ example we will change the URLs to be even friendlier soon. In the future we plan on opening it up for anyone to create a Micro-portal for their community without our interference. If there’s a particular community you’de like to see us creating a Micro-Portal for please email me. We’re happy to announce that we closed a $2M Series A fundraising with Greylock Partners and Gemini, both excellent, top-tier VCs. This is great for eSnips, we’re all thrilled. With the funding itself comes an amazing and extremely experienced team responsible for some of the most successful investments in the Internet space and in tech industry in general. They are very impressive people with a very unique approach to entrepreneurs and entrepreneurship. So what got them to decide to invest? Well, there is nothing more convincing than strong traction and fast growth, and eSnips has been getting a lot of it since we made the beta available. Almost one million users joined eSnips and contributed great content that is attracting in turn millions of visitors per month to the site. There’s content about almost any topic you can think of, and it’s all user contributed….it’s all about our users, their content and the communities they form on eSnips. Marshall Kirkpatric wrote about it today on Techcrunch. 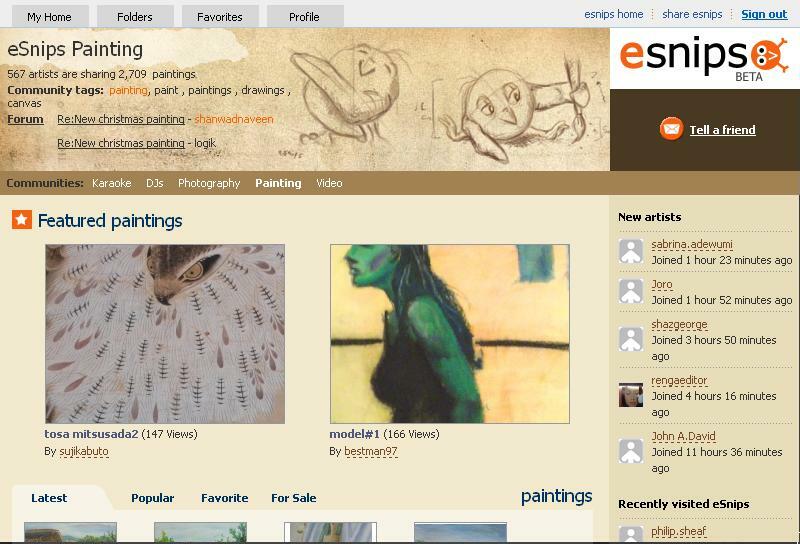 I was pleased to see that Marshall remembered and emphasized eSnip's unique mix of ecommerce functionality within social sites and user generated content. Marshall wtore about the ecommence addition when we launched it back in July. “eSnips provides a simplicity and comprehensiveness that can capture a mainstream Internet audience well beyond teens,” said Erez Ofer, partner at Greylock Partners. “As social sharing site use expands, the winning players will be those who provide a central location with broad appeal and strong e-commerce capabilities. eSnips is well-positioned to deliver upon on the promise of this sector,” Ofer said. A couple of weeks ago we added the ability to create video and audio right from within eSnips. Cool feature that makes it really simple for anyone to create and share video and audio online. People love it. It’s fun. My 8 and 5 year old daughters, accompanied with 2 friends swarmed into our office last week and sat in front of the computer Here’s the result: Not very civilized I’m afraid, but sweet. We've been chosen to present at DEMOfall 2006 at the end of this month. eSnips is one of 70 hand-picked new technologies who will present this year. This is very exciting. It's a great place to talk about the upcoming version and the really cool features we are adding to make it even more simple and fun to share, socialize, sell or promote anything related your hobbies, interests, family, creative work and other aspects of our professional and personal lives. Chris Shiply's, Executive Producer of DEMO conferences describes eSnips appeal and potential: "Social publishing will soon be as ubiquitous as email. The winners in this space will be the ones who understand the needs of the mainstream, not just teens and early adopters. eSnips is more about the mainstream, the space that fills the gap between teenagers (the bulk of the social networking platforms) and the vertical sharing sites". It has been quite a while since my last post. Things are getting just too busy here and updating a blog seems like a real luxury these days! We are all working on a GRRREEEAT new version that will be launched in September. More to come soon. Make sure you follow the esnippers den for more info on what this version will include! Also – check out eSnips on Alexa. Looks good. hope the next version will keep this momentum going!